I don't think it is banded as with the DS SNR Margin at 3.4dB there isn't any more speed to be had. The error stats look very good too. Actually since Feb 2017 the service was switched from BT Wholesale to Gamma and then just over two weeks ago to PlusNet Business. Each time losing download and upload. What can be done to recover this loss of download and upload? You would need to convince Plusnet to send an engineer to do a port swap, switching you from the ECI cabinet to the Huawei. OpenReach refer to this as a "lift & shift". I don't know if it's even possible for them to do this. The system might just pick any free working port. Convincing Plusnet to do this would be very difficult. Finding someone who understands your request might be a stretch. Then they would need to convince OpenReach to change your perfectly working port. It would likely set a precedent. Having both cabinet Vendors on the same PCP is becoming more common. I'm not sure OpenReach would allow this. I did what you want to do, but I ceased my line and reactivated it to achieve this. I didn't even try requesting it as I wouldn't expect them to do it. You could also try ordering a 2nd line in the hope that gets commissioned on the Huawei cabinet. The line is interleaved but the attainable isn't as high as I would expect. Looks to me like the line has synced at 6dB, and dropped to 3.4dB some time after sync. This had lowered the attainable too. I'd still guess the line is banded. It may even sync lower than that figure next resync though. I'm sure that in another post BS said it wasn't... for the reasons you have already mentioned. j0hn, thanks for the reply. So after you ceased and reactivated you got a different DSLAM? Huawei? I am struggling to understand why a service that once achieved 21Mbps is dropped so significantly. 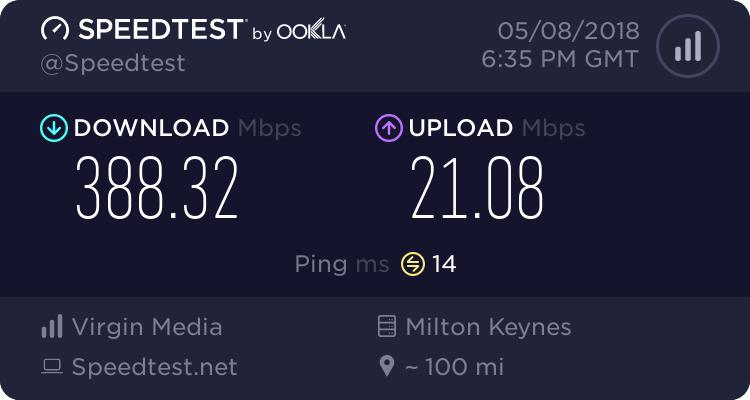 I know that it is working but it is incredulous that the download speed is being eroded away and Openreach consider it acceptable. I will have a go at a lift and shift as have been successful at this previously. Is there any reasonable explanation as to why the erosion on the download and upload? Cross talk, line faults, Rein/Shine. My upload has dropped from 12 to as low as 6 and is currently at 8Mbps. Download has varied between 55 and 38 over the 6 years I've had it. By the way if you cease and reactivate you'll still be on the ECI cab, you need either a new line or down grade to ADSL, even then there are no guarantees of getting on the Huawei cab. Ronski, thanks for the reply. I was beginning to think that we are looking at some kind of fault. I just struggle to understand why when merely changing ISPs that the download would drop by 4Mbps. I can't seem to find any reason for that. I know DLM will probably been involved but losing 4Mbps because of a change in provider seems odd. Hi Gary, I don't have any data to know whether it was on fast path or not?